This is the best introduction, in either English or German, to the work of one of the most important Catholic theologians in the last half century, Cardinal Walter Kasper. Cardinal Walter Kasper is undoubtedly a major figure in the church today, standing tall among contemporary theologians, epitomizing the theologian's task of mediating between the Christian tradition and contemporary culture. This book, which includes insightful surveys of Kasper's work by a stellar array of leading North American theologians as well as personal and pastoral statements by Cardinal Kasper, presents an excellent account of Kasper's theology-as consistently pastoral and insistently ecclesial-and his vision of the church in dialogue with the world. In all, it attests to Kasper's unswerving commitment to `speak truth in love,' in service of God and of Christian faith, both within the Catholic communion and beyond it, through his remarkable contribution to the cause of Christian unity and in the promotion of Christian-Jewish relations. With its origins in a 2013 conference held at the University of Notre Dame, Indiana, this most welcome book will surely serve as a useful reference for evaluating Cardinal Kasper's extraordinary contribution as churchman, theologian, and pastor to the church, academy, and society. The overall impact of reading this book, for this reviewer at least, was akin to what might be appropriately called "an Emmaus experience." Not until the last 50 of its 300-plus pages does the reader "hear" from Kasper himself. And it's well worth the wait. . . . The reading of this book may indeed trigger "an Emmaus experience" for the reader, especially in terms of how Cardinal Kasper's approach to theology may show itself as so much more than one had hoped for or imagined. The overall impact of reading this book, for this reviewer at least, was akin to what might be appropriately called "an Emmaus experience." Not until the last 50 of its 300-plus pages does the reader "hear" from Kasper himself. And it's well worth the wait! . . . [T]he reading of this book may indeed trigger "an Emmaus experience" for the reader, especially in terms of how Cardinal Kasper's approach to theology may show itself as so much more than one had hoped for or imagined. I am currently reading the edited volume of the papers from the Kasper symposium at Notre Dame. It is stunning—important, lucid, interesting, a document of record. There is no comparable presentation and recent analysis of the theology of Walter Kasper in German. This volume deserves to be highly recommended to the general reader as well as to the specialist. Hopefully, it will lead us to read Kasper himself. In this remarkable Festschrift, some of today's most distinguished theologians explore the achievements of Cardinal Walter Kasper as a systematician, a contributor to the ecumenical movement, and a leader in Jewish-Christian relations. Lucid and readily accessible, these essays will benefit both students and professional scholars. Personal anecdotes from Kasper's former students, colleagues, and dialogue partners complement the volume's general introduction to his life and career. The volume ends with three contributions from Kasper himself, so that its dialogue about Kasper becomes a dialogue with Kasper. This book deserves a place in every theological library. This is a welcome and timely volume. . . . The various contributors help to situate Kasper solidly within the long line of great Tübingen theologians, particularly those who have influenced ecclesiology, Pneumatology, and the cause for Christian unity. . . . I highly recommend this very helpful and timely Festschrift. 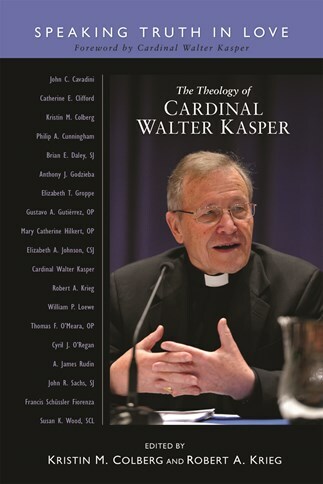 Warm thanks to Krieg and Colberg for editing these fifteen brilliant essays, describing the insights of the acclaimed cardinal-theologian Walter Kasper, shared at the University of Notre Dame colloquium (which I happily attended!) to celebrate his eightieth birthday. These North American professors provide a trusty GPS to navigate his doctrinal, ecumenical avenues while suggesting some still-unexplored lanes.